One of the images I had in mind was a bright yellow canola field juxtaposed right next to a lush green barley field. I wanted that look of the solid green and gold in stripes right next to each other. 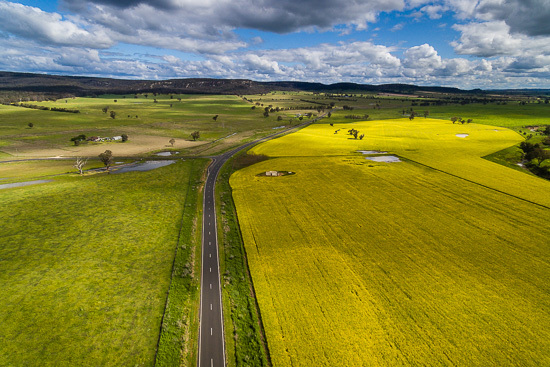 Here at last our first decent looking canola field on our road trip towards Dunedoo. Whilst I didn’t quite find that here. I had to make do with the lush green foliage on the road verge next to the neat canola field. Plus a somewhat less well maintained nor consistent field over the road. I was very happy with the interesting lines and shapes I was able to put together here. This nice clean section of well kept tarmac provided that sharp central pivot between the organic coloured shapes. 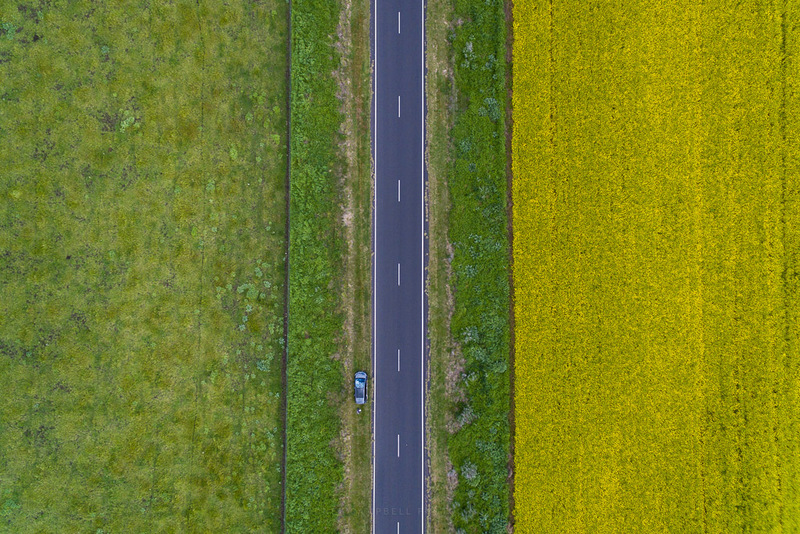 And in the end perhaps it’s that more natural unkept nature of the paddock on the left set against the sheer conformity of the canola on the right which adds even more dynamic presence to the shot. Sometimes nature knows better than my minds eye :). Above and below some BTS (behind the scenes) of the region. Truth be told however these are more than casual BTS shots. I put some thought into the compositions and am happy with the great light and the end results. That said they do put some real context into what these very structured and almost manicured fields look like. From the ground they do look relatively tidy in the interior but perhaps a little rough at the edges. It’s only from the air that you can truly appreciate the meticulous work which has gone into planting, growing and maintaining the crop. More hunting for interesting aerial patterns. My two eldest daughters joined me this afternoon for a trip south west to Dunedoo. First stop this herd of cows :). Actually it was this interesting looking field and shapes I was drawn to – the cows were an extra bonus :). It was another driving opportunity for my eldest daughter, and really it was a good excuse to get out of the house and do something :). What I was actually looking for however was a nice canola field. We’d seen a few nice ones on the drive in from Sydney to Coolah. 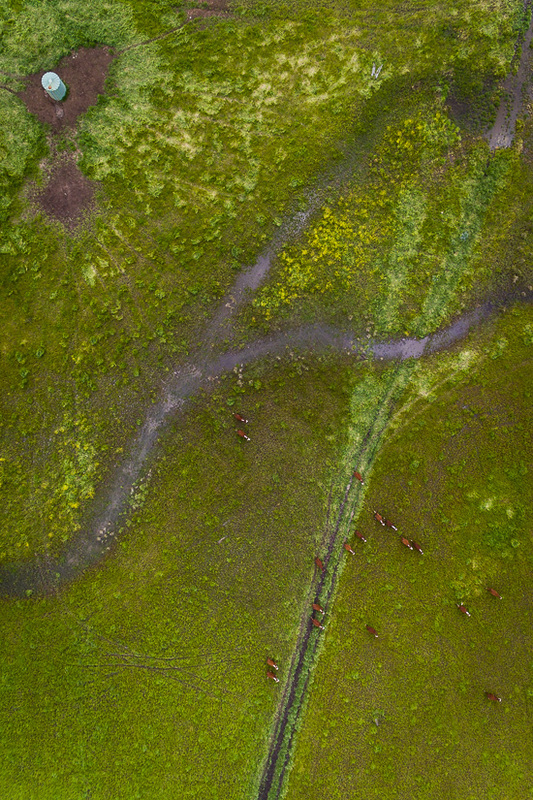 However no-one was really willing to stop and let me fly the drone for half an hour :). 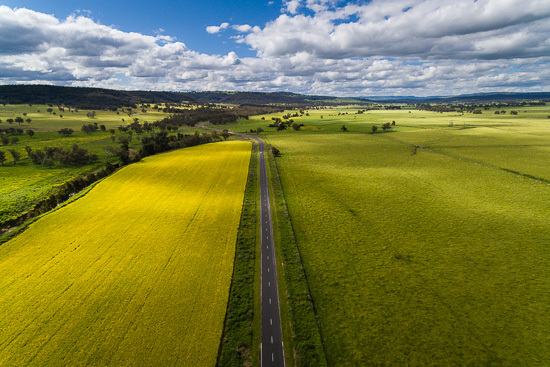 My parents in law however said there would be a few good fields for me to shoot on the road heading towards Dunedoo. I had a few ideas in mind for a couple shots I’d like to get. So as we drove along I was on the lookout for a good candidate. Our destination – Dunedoo is another small village of around 1000 people. It’s another place we hadn’t been to before so it was as good a destination for a learners practice drive as any :). On the western side of town is the Coolah Cemetery. It might be a dark and scary place, lets hope the zombies are not out tonight! Truth be told I was just looking for somewhere dark to shoot the night skies. A place where I could also include something in the foreground and midground of my images. This cemetery at the edge of town seemed a potential choice. I setup for a stitched panorama again in this semi open space with this large obelisk in my foreground and headstones receding over the nice grass into the distance. It was obvious that there were some bright street and house lights on the other side of the cemetery. They were going to cause problems in the high ISO images but I was here so I figured I’d wing something on the fly. I couldn’t stop the lights so I figured I’d run with it. Adjusting my position so the lights would be behind and backlight my chosen obelisk. Little did I know it would turn out this well however. So this is the result of panorama stitching two rows of six (6) vertical frames (12 in total). 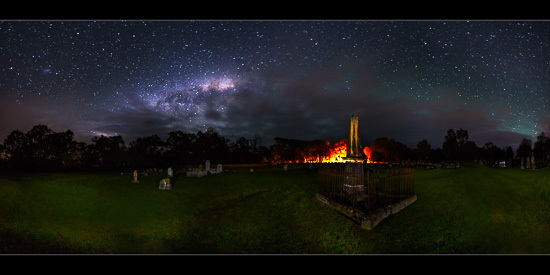 I’d placed my obelisk on my eventual right third with the arch of the milky way going across the middle. I could see the clouds coming in fast so I only managed one set of frames before the clouds started taking over the sky. Even still I kind of like the result of the long exposure streaky clouds being slightly lit by light pollution. It even looks like the milky way and the green airglow behind it is backlighting the clouds in the sky. And those annoying tungsten street lights and house lights – what can I say… Awesome – looks like someone has fire bombing the cemetery with napalm. It’s all that can be done to hold back the horde of zombies scrambling out to get me! A phenomenon I was aware of with taking night sky images is known as airglow. It’s actually pretty common but I hadn’t seen it strongly in many of my images thus far. 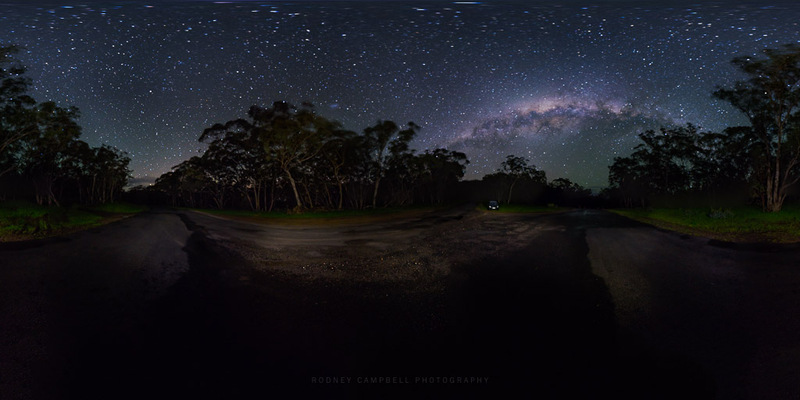 The two images I took this night however had a very strong green airglow. It can be seen clearly here as the bright green in the sky above the clouds on the right side. Airglow (also called nightglow) is a faint emission of light by a planetary atmosphere. In the case of Earth’s atmosphere, this optical phenomenon causes the night sky never to be completely dark. Emerald green, and visible on dark nights everywhere on Earth, airglow pervades the night sky from equator to pole. Airglow turns up in our time exposure photographs of the night sky as ghostly aurora-like light about 10-15 degrees above the horizon. Its similarity to the aurora is no coincidence. Both form at around the same altitude of around 100 km and involve excitation of atoms and molecules. Unlike the aurora, airglow does not exhibit structures such as arcs and is emitted from the entire sky at all latitudes at all times. A photochemical reaction occurs high in the atmosphere. Airglow is the result of various atoms, molecules and ions that get excited by ultraviolet radiation from the Sun and then release that energy as visible (& infrared) light when they return to their “normal” state. It’s not entirely unlike glow-in-the-dark toys :). Most of visible airglow comes from oxygen atoms and molecules, which glow green. And as luck would have it, for me this bright green airglow just adds to the zombie feel of the whole scene :). There is something which you probably can’t see on these small for web versions of these images. It’s something I unfortunately didn’t notice till I got back to the house and was packing away my gear. The Samyang 14mm is a manual focus lens and I must have bumped the focus ring at the start and it was set to focus around 1m. This is too close when shooting wide open at f/2.8 and so the depth of field didn’t extend even to the midground let alone the stars. So alas the stars and even the trees in the midground are out of focus :(. The images still look pretty good at screen resolution. However zoom in on the interactive 360˚ view or if I zoom to 100% on my stitched pano and it’s obvious. Sadly no printing of these images for me :). A quick evening trip down to nearby Berry Island reserve for sunset. The folds and stripes throughout the sandstone along the waters edge around the island never ceases to amaze. It’s a lovely spot for a walk or to just chill out with the family and watch the sunset here on Sydney Harbour. It’s not technically an island anymore. It was originally one of Sydney’s Harbour Islands, but it is now connected to the mainland by a constructed isthmus. The area is now a council reserve, open to the public and there is an interpretive bushland walk, playground and picnic area at the site. 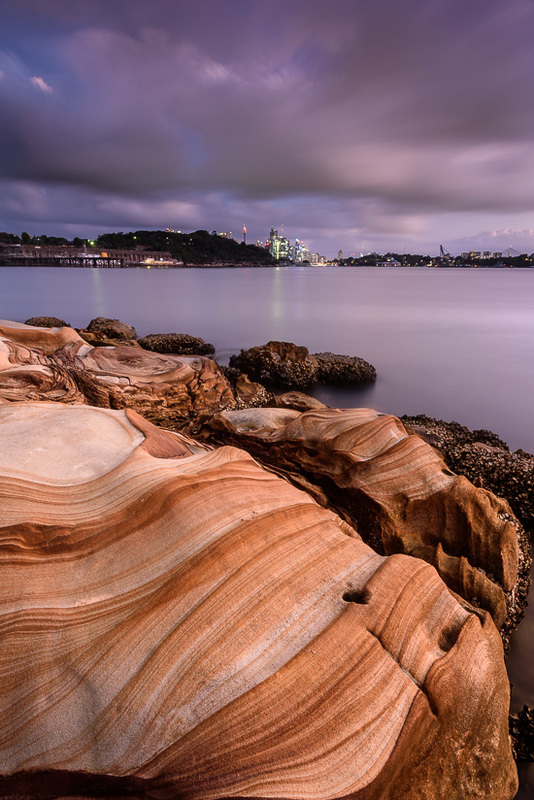 I’ve not seen any other areas along the harbour foreshore with such pristine striped sandstone as appears here. Out alone in the dark once more… here on the road heading towards Mount Hope on the western side of town. I’d done a little forward planning before my family headed out to Coolah to stay with relatives. I mean we were staying out in country New South Wales. 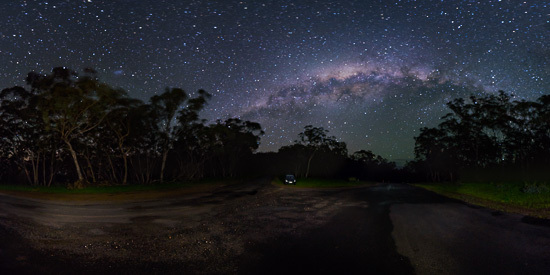 My chances for dark skies were much more favourable than my usual Sydney locations. Coolah is fairly close to places like Coonabarabran (where the Mopra Observatory and Radio Telescope is). I hadn’t actually planned it this way but it turned out the New Moon was in the middle of my stay here :). Excellent news if only the weather would accommodate. Unfortunately it wasn’t looking good – it had been overcast and rainy the first two days here. However around sunset this our second evening here it looked like the sky was clearing nicely. After dinner I headed out to look for a place to shoot. I hadn’t really planned anywhere specific to shoot but I had a few places in mind. Checking on Photo Pills I looked up what the astro conditions were going to be. I noted that the arch of the milky way was going to be visible. Not only that the core of the milky way was going to be out. Excellent news!. The arch was going to run sort of north south. It was also going to start more overhead at astro twilight and then lean over to the west during the early evening. There was this really nice set of silos I’d been eyeing off during the day to include in a shot. However they were on the east side of the main road into town. When I got there at night there were also street lights all around behind it. Scratch that off my list :(. I figured it best to head to the west of town. That way I didn’t have to deal with the bright lights of town and the light pollution. Coolah is only a very small town but when taking astro shots even the faintest of lights can really mess up your shots at high ISO’s. One of my relatives farms is up on the hills above the town to the west so I headed up that road. I was hoping to get somewhere high enough to see the sky clearly. All without going over the top where any light pollution from any distant towns to the west might interfere with my shots. This is the intersection of three roads near the top of the hill. To the left is the road heading down the hill to Coolah. To the right a road I’ve never travelled which goes to Neilrex and Mendooran. Finally the road in the middle is Mount Hope Road. It wasn’t a great location but I figured I was out here so might as well give it a try. My first attempt at a stitched panorama bombed. A car came half way through and I had to get off the middle of the road :). This is my second attempt. I took enough shots for two complete rows (one horizontal and one 45˚ angled up). With the Samyang 14mm vertically these two rows of eight (8) images gives me enough to build a near complete 360˚ by 180˚ spherical panorama. So in addition to the cropped panorama which leads this post I give you a full 360˚ spherical (equirectangular) panoramic projection. and finally a version in an interactive 360˚ panoramic viewer. Here you can pan around left and right and up and down in the scene.